We stuck around for a couple of hours on the morning of the 9th to follow the news of the US Election and to watch the social media world go mental. It was a good feeling to turn off the gadgets and head off into the hills for a week. 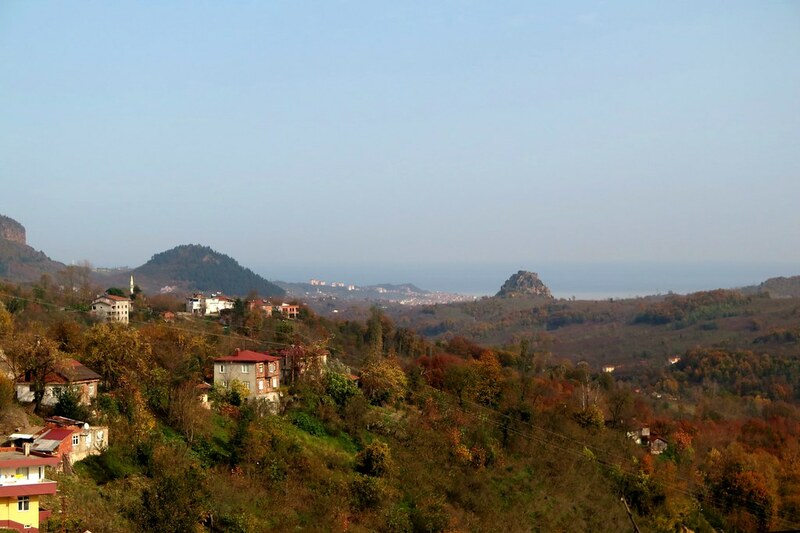 Leaving Unye, we immediately turned inland and said goodbye to the Black Sea. Within a kilometre we started climbing, stopping soon after to shed a couple of layers to ride in tshirts for the rest of the day. 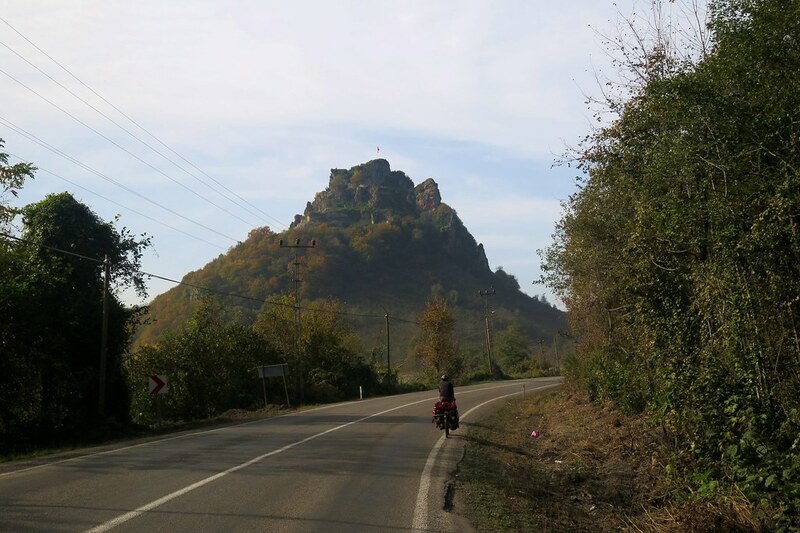 We passed Unye fort, an old ruin perched on a rocky outcrop above the town. Progress was slow and we stopped after a couple of hours to pick up some bread from a bakery. The guys in there invited us in for chai and, as we were in no hurry, we gladly accepted. The basics were covered, where we’re from, going to etc, do we have kids (why not!? ), what is our profession, all the standard questions. 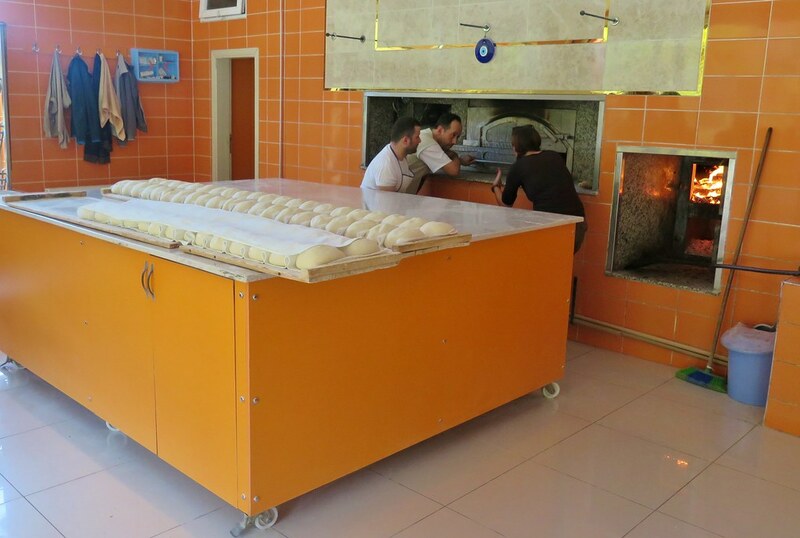 Then when we showed a bit of interest in the bread being baked, they let us look around and showed us the oven, explaining the whole process, in Turkish. Returning to our bikes, a kitten had perched on top of my pannier, giving Clare another cute animal to play with for a little while. Halfway through the afternoon, the speedo ticked over 2,000km, which added to 14,000 gives us 16,000km, or 10,000 miles in old money. Big distance, mini celebration beside the road and a few photos. 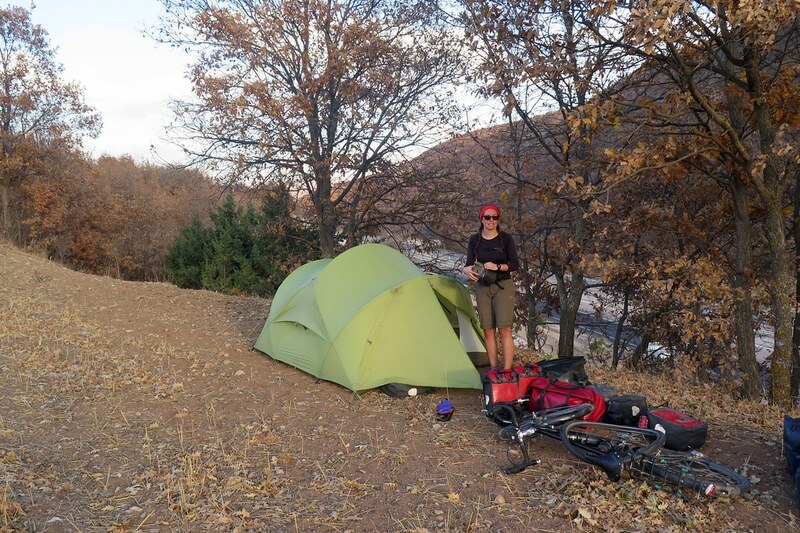 The rest of the day was uphill, a few short downs in between, but generally climbing until we found a flat camp spot in a clearing in the woods at around 1,000m. The trees around us were covered in autumnal leaves, but during the night the wind really picked up, gusting around us and whistling through the branches. 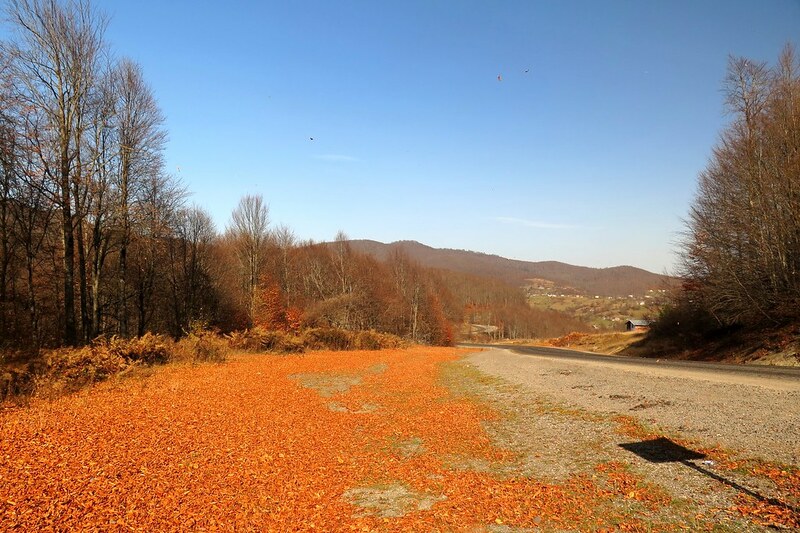 When we woke up the next morning, the trees were bare, all the leaves had been blown off. The wind was strong through the morning, sometimes behind us, but mostly in our faces as the road cornered and curved its way uphill. Slow progress again, up through the hills until we stopped for a tea break at 20km. Soon after we stopped in a small layby, a family pitched up in a car and got out to have a picnic. They came over to us and, seeing our meagre spread of biscuits and a couple of tangerines, they gave us some extras from the feast they’d brought with them. 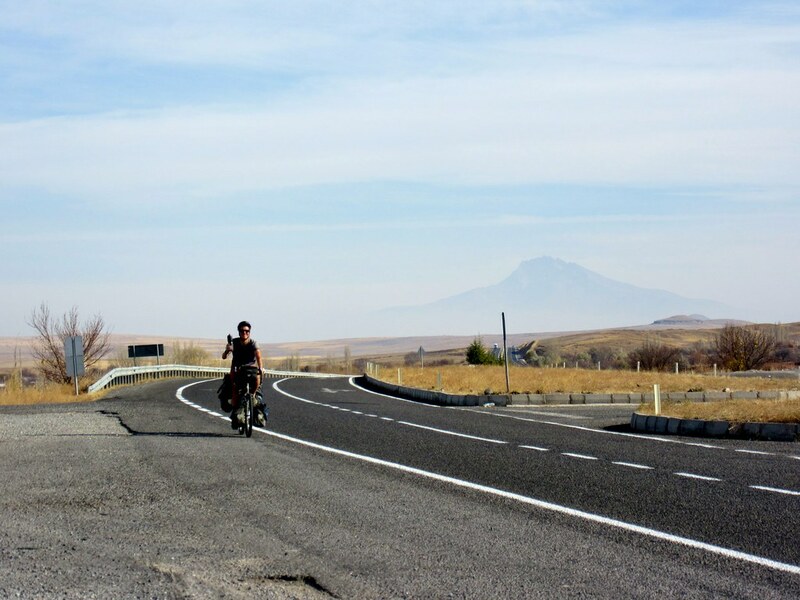 It’s been nice to be on smaller roads which has given us more chance to meet people, as we were seperated by road barriers a lot when we rode on the motorway along the coast. 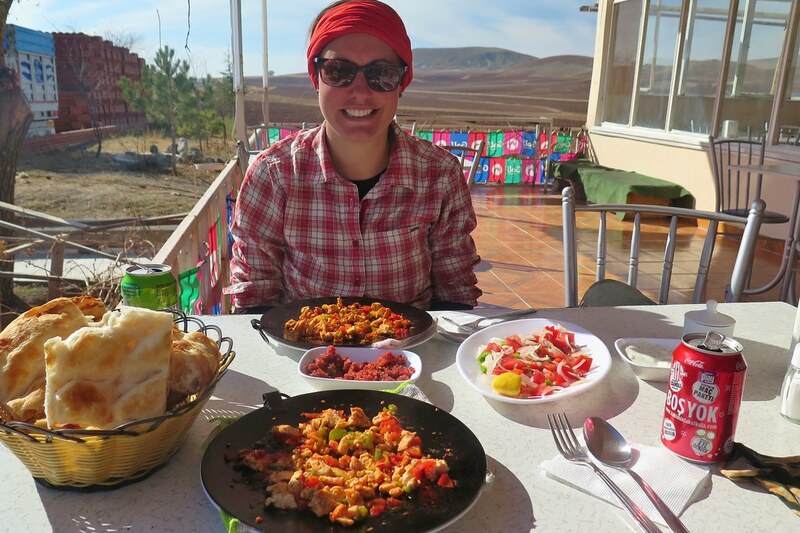 We reached a high point in the hills and cruised along the ridgelines past Akkus where we stopped for lunch. 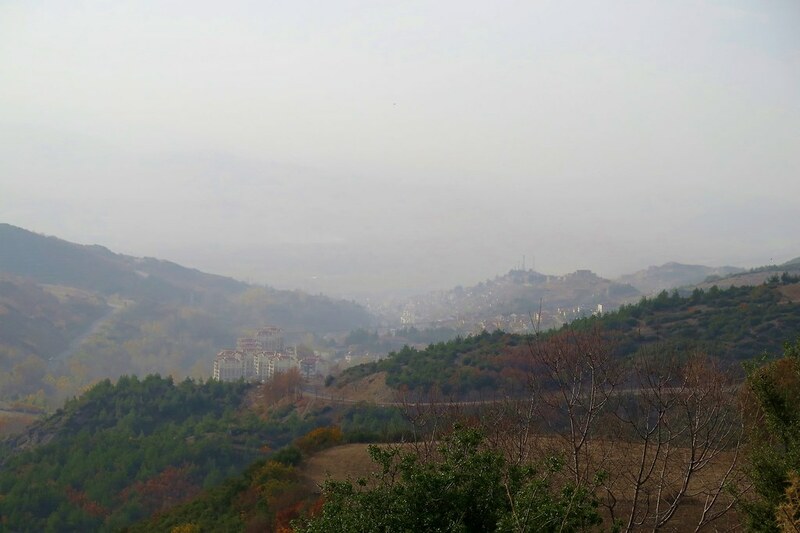 We’d only covered 45km, but then we hit a long downhill into a deep valley which was very hazy from a few hill fires. I think the farmers are burning off their fields after harvesting their crops. It was a fun half hour cruising downhill, but we surrendered almost all the altitude that we’d gained over the past couple of days. 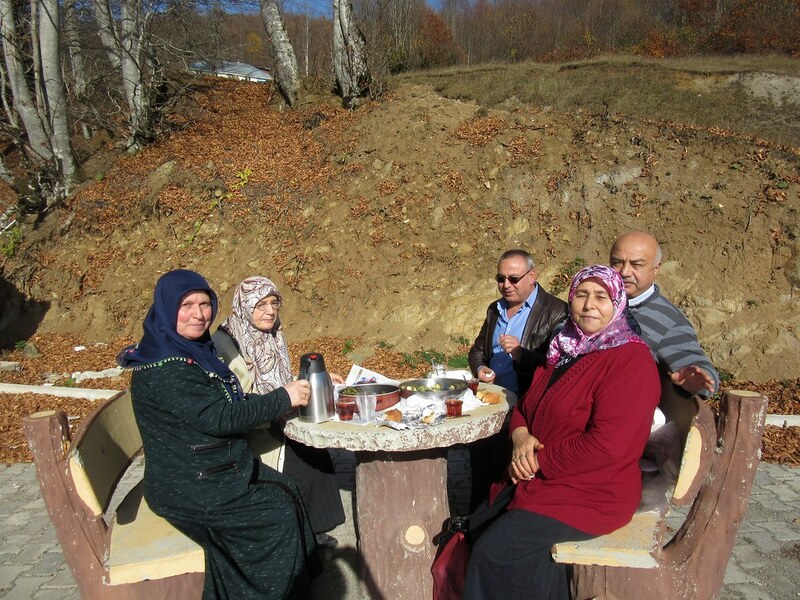 We reached Niksar in the bottom of the valley where we stopped at a petrol station for water, and a nice Turkish coffee which the staff there offered us. A little way out of town we stopped for the day to camp in an orchard, leaving the climb on the far side of the valley for the morning. 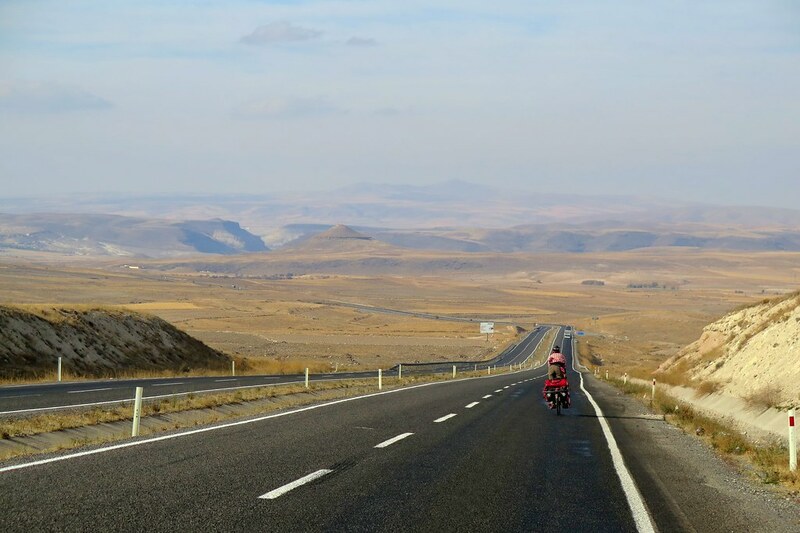 For the next couple of days, we were climbing up onto the big plain in central Turkey, heading roughly towards Sivas. 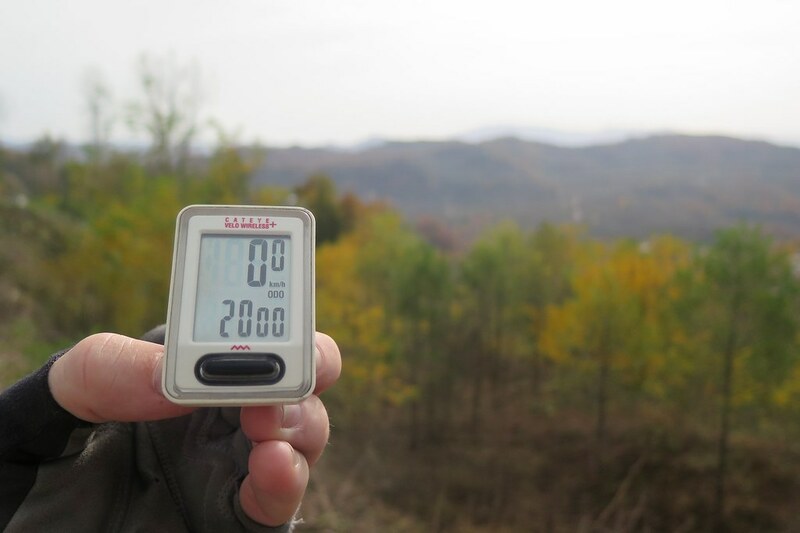 It wasn’t a huge altitude gain, up to a maximum of 1,600m, but it came incrementally in a series of short sharp climbs. The first of which took most of the morning, grinding up out of the valley at gradients of around 10%. The views back were good though, still a bit hazy from the fires, but much clearer than the day before. At the top, we reach a flat section but we’re hit with a headwind. The weather so far has been generally sunny, and a lot warmer than we were expecting. I guess the warm air is coming up from the south, which for us means headwinds. Swings and roundabouts! 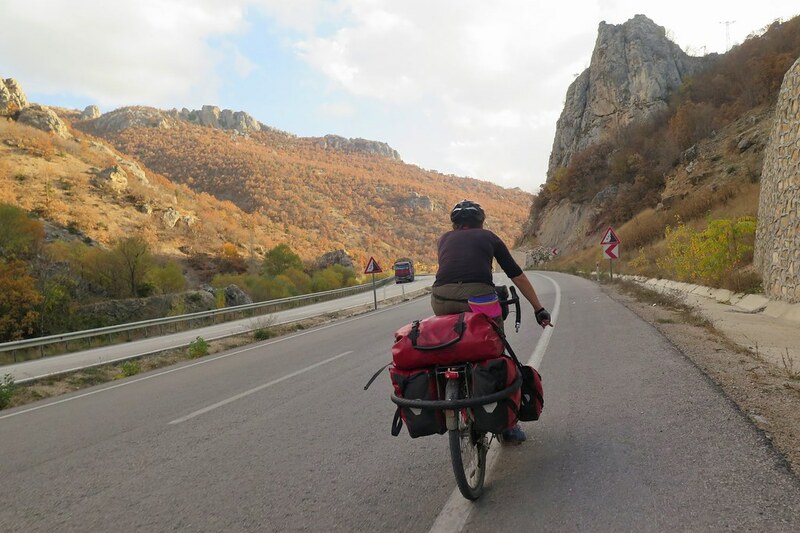 We pass through Tokat, quite a large town where we pick up some supplies from a supermarket, then continue climbing up into a gorge with small cliffs on both sides. 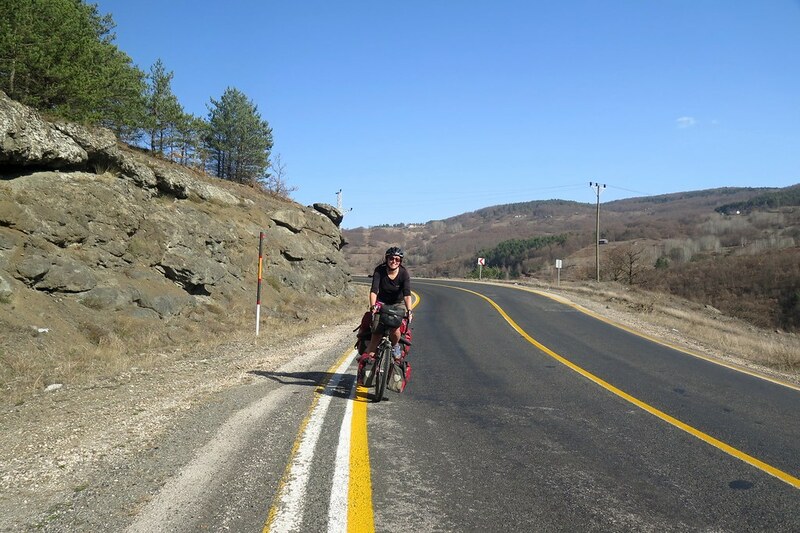 A few kilometres into the climb, we round a corner and see that the gradient got steeper. Our legs were tired, so we decide to call it for the day as we saw a sheltered place to pitch the tent just above the road. 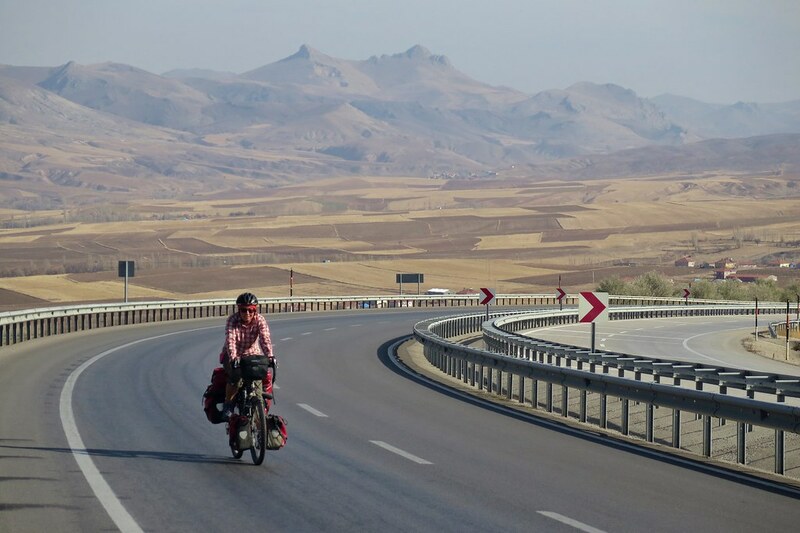 Before we reach Sivas, we turn off onto a minor road to cut across country on to the main road to Kayseri. It’s really quiet, passing just a few villages, surrounded by some farmland and some empty grassland. We stop off in a village for some water and then think about stopping for the day. Finding somewhere to camp was easy. The farmland has all been harvested so we can choose almost anywhere. We find a spot just over a mound beside the road, facing East to catch the morning sun. 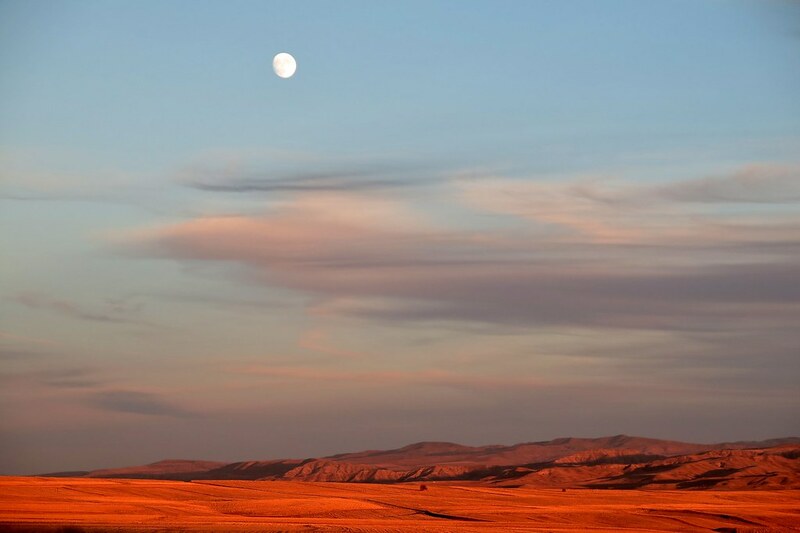 The moon rose in that direction too, just as the sun was setting making the fields and mountains glow orange, a beautiful view for our dinner. We were grateful of the suns rays in the morning as the temperature inside the tent was zero when we woke up, and the outside was covered in frost. 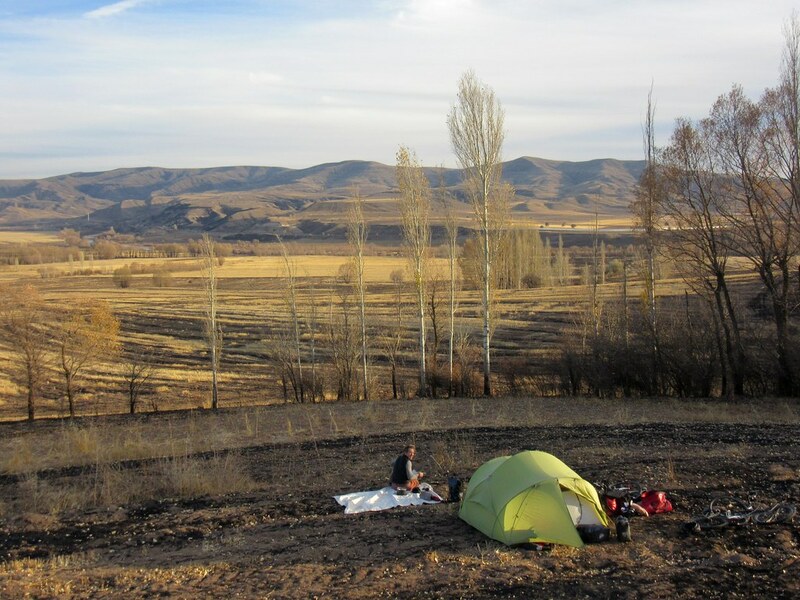 We warmed up with the rising sun, and more so once we’d had some breakfast and packed up the tent. 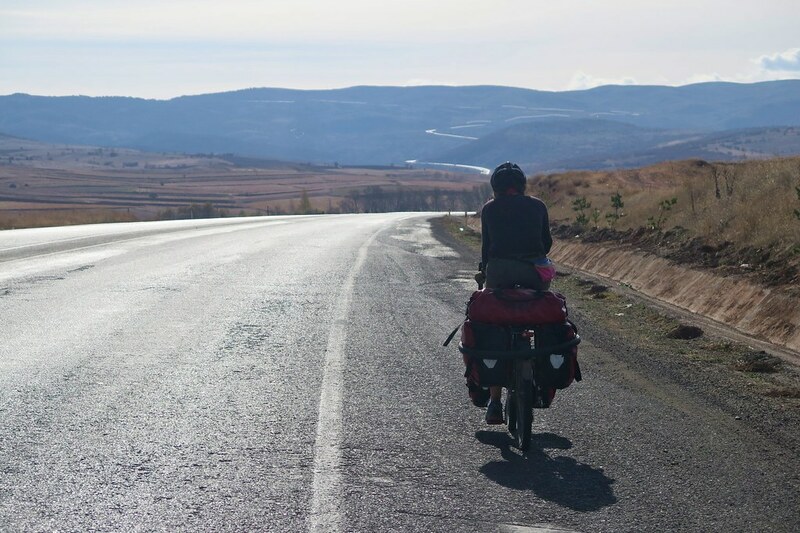 Back on the bikes, the road took us gently downhill which was very chilly on the hands so we dug our thick gloves out. From here on, we were up on the plain at about 1,300 metres, which meant cold nights and mornings, but by mid morning it warmed up into the 20s. We stopped for our tea break at around 11, and stripped off the layers to shorts and tshirts. We had slight ups and downs, but the terrain was generally rolling. The views were good, there were moutains in the distance and the sun was shining. Happy days. 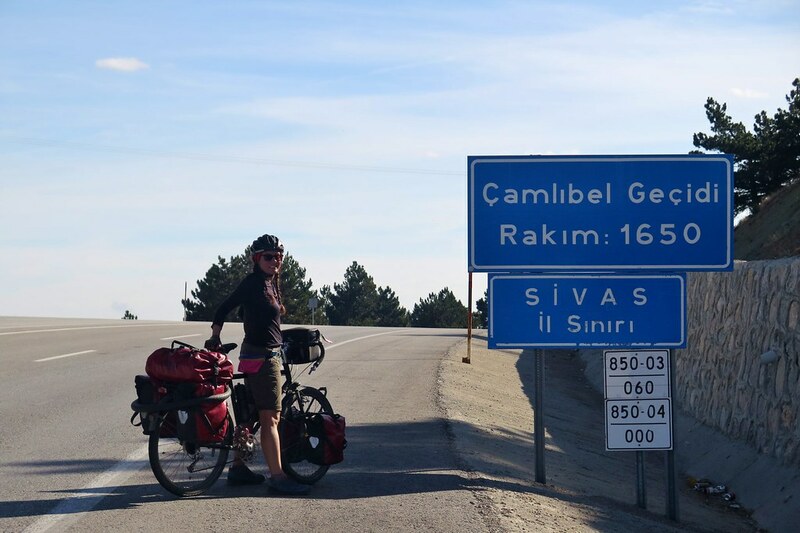 We really are loving cycling in Turkey so far. Even back on a more major road, the traffic was quiet and we’re able to comfortably ride two abreast. 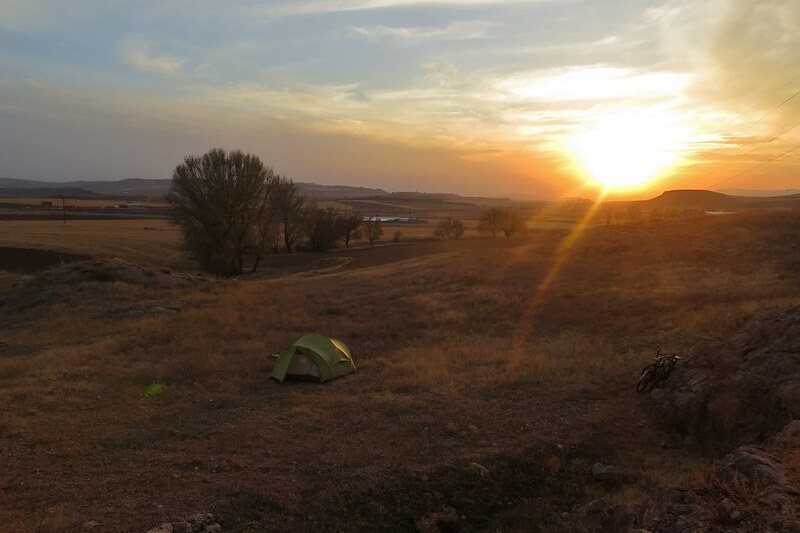 Camping is easy again, we take a dirt road off towards a mound, pitching the tent behind it, facing east. The sun wakes us and its another cold start. 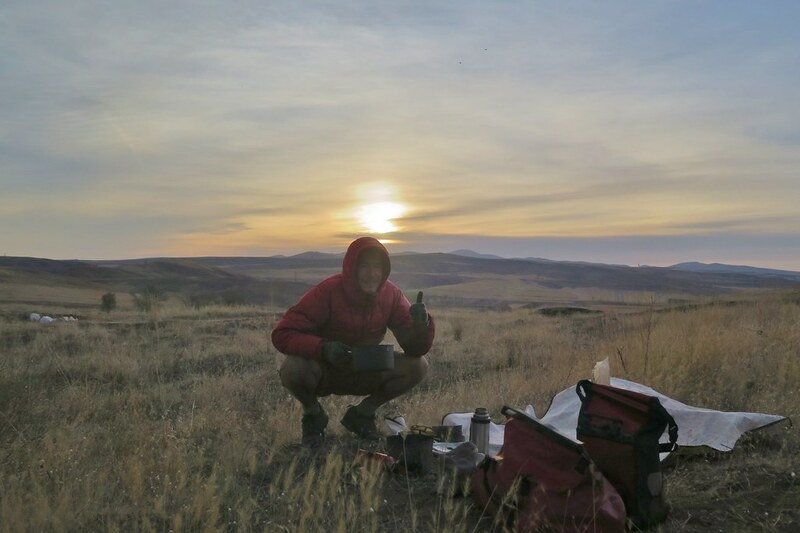 I need my down jacket to get out and make the coffee, but I love being outside watching the sunrise over the hills. 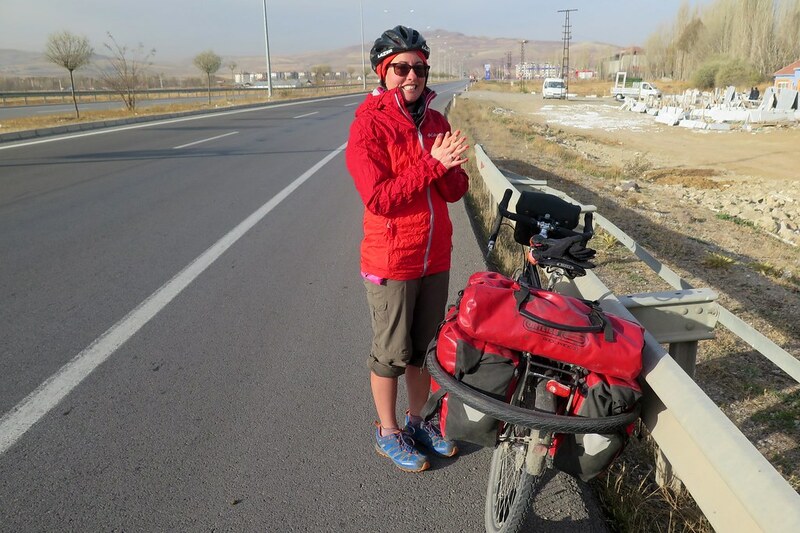 We set off, but then stopped again after a few kilometres to double up the gloves and pull on a windproof jacket. Soon after, we met another cyclist heading the other way. 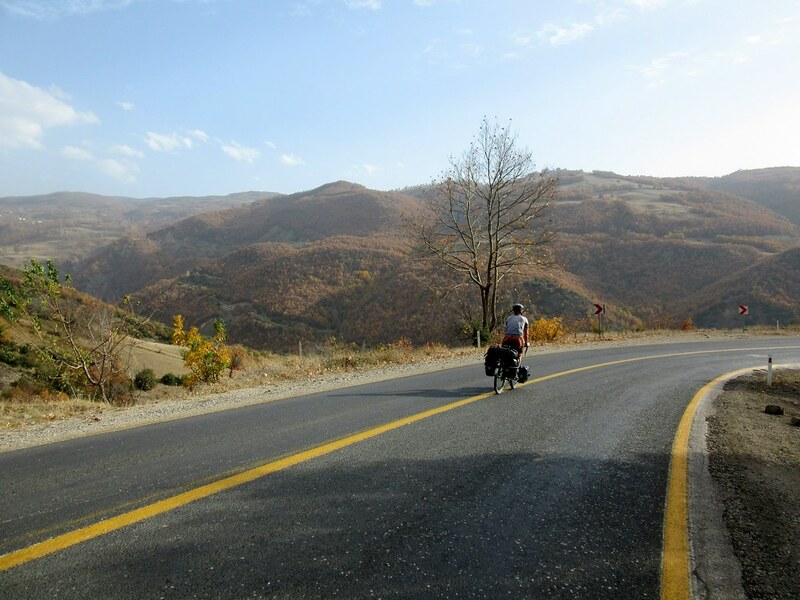 Tim, from Sweden heading towards Iran. He’s only wearing shorts and a hoody and we’re all wrapped up in jackets and gloves, soft Brits that we are. It’s good to chat for a bit, as it’s quite rare for us to meet other tourers these days. Once we head off, the sun is higher in the sky and we have a short uphill, so we’re nice and warm again. 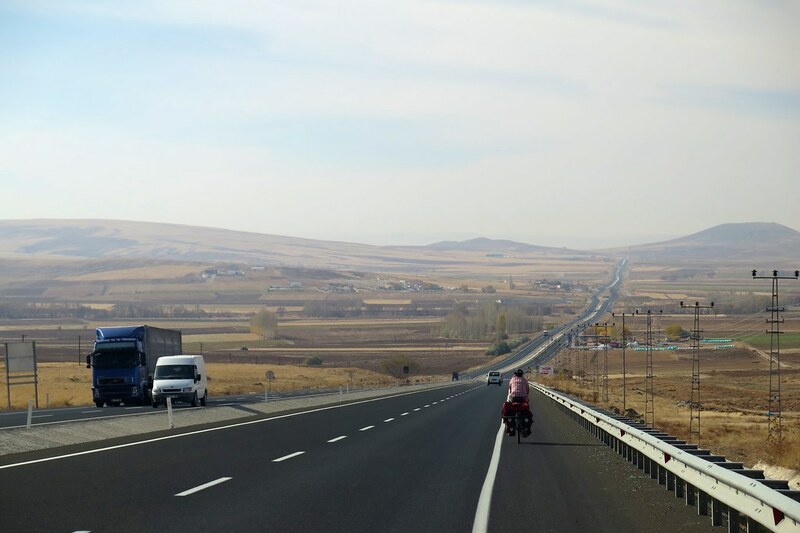 We’re following the main road towards Kayseri, the biggest city in this area. There aren’t many other towns or villages so we stop at a petrol station for some lunch. The petrol stations here are great, they all have shops, clean toilets, cafes, often wifi and usually the offer of some chai! 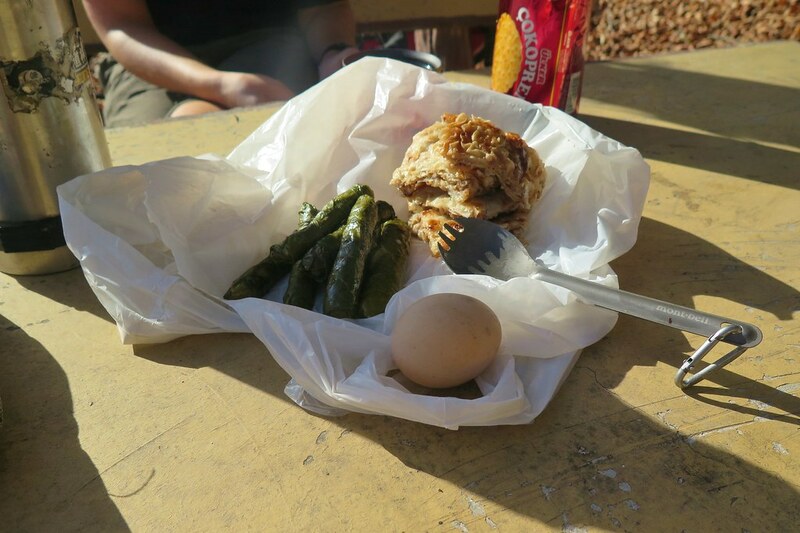 We sit outside in the sunshine, enjoying a delicious lunch and feeling really warm. It’s amazing the range in temperatures we get in just a few hours. 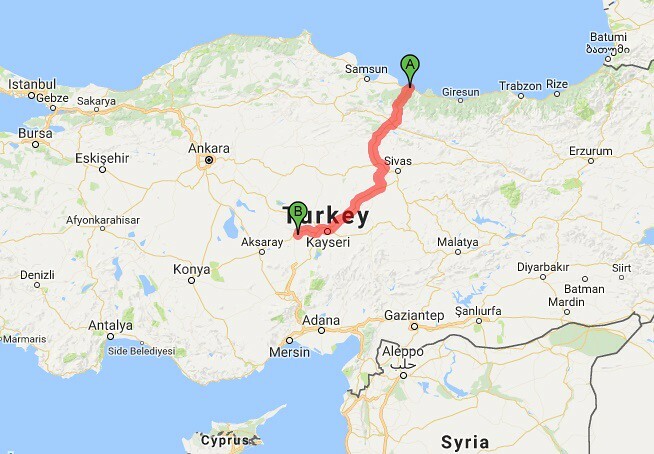 We’d planned out a couple more days of riding to get us to Goreme in time for some snow that was in the forescast. 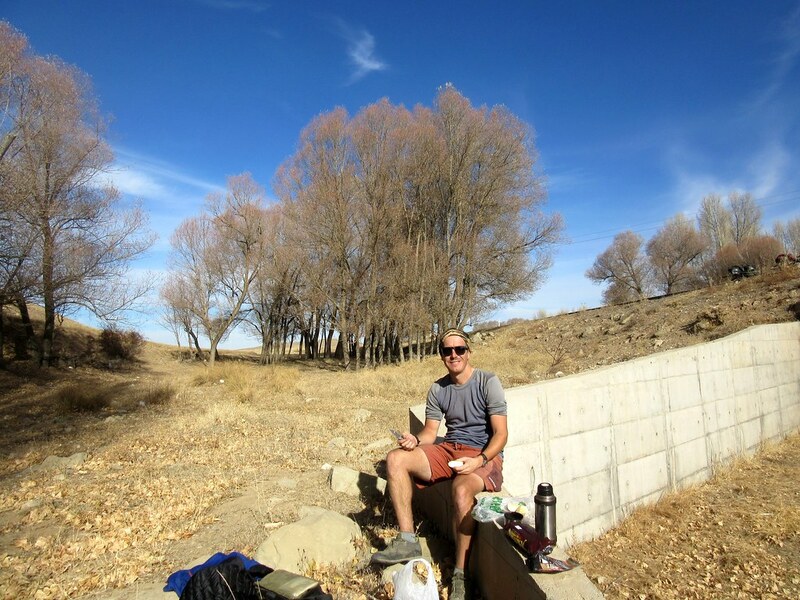 It gave us some mellow days with not huge distances, so we had a slow lunch before heading off mid afternoon. 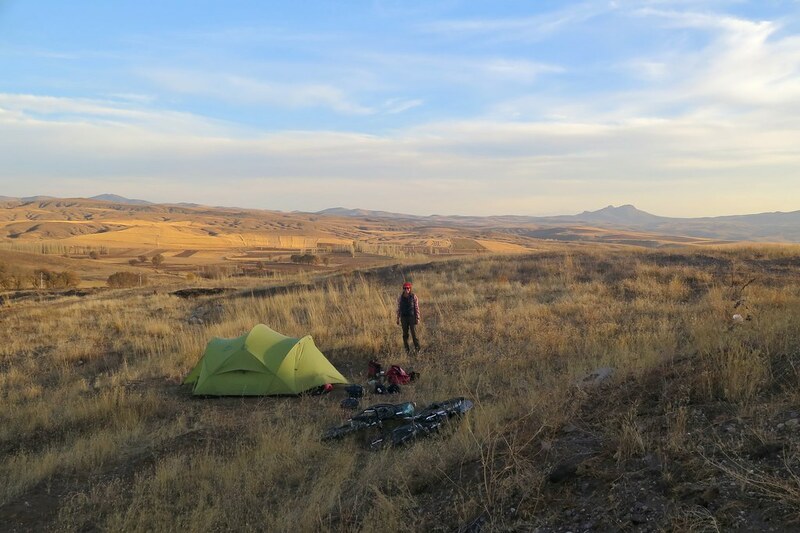 Before reaching the outskirts of the city we stopped, heading off up a dirt road towards a rocky bluff to pitch the tent. We were treated to another stunning sunset from the rocks as we had our dinner. 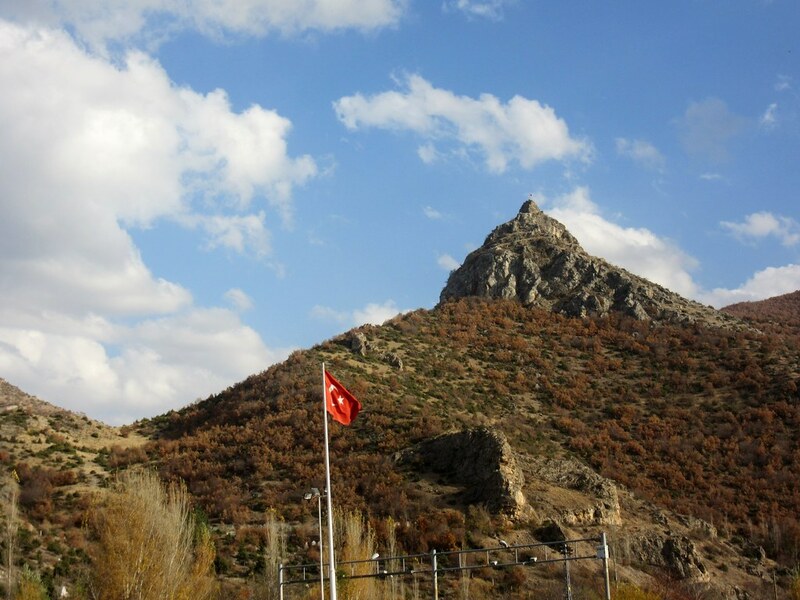 We continued into Kayseri the following morning. We hadn’t realised how big it is – over 1 million people. We took the shortest route which took us right through the city centre. 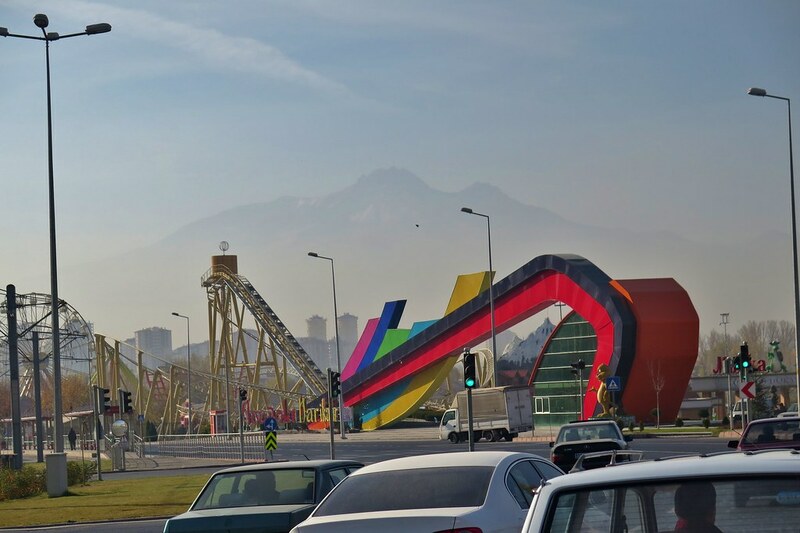 Nearby is Mount Erciyes, a 3,917m volcano. We can just about see it floating above the smog that sits over the city. 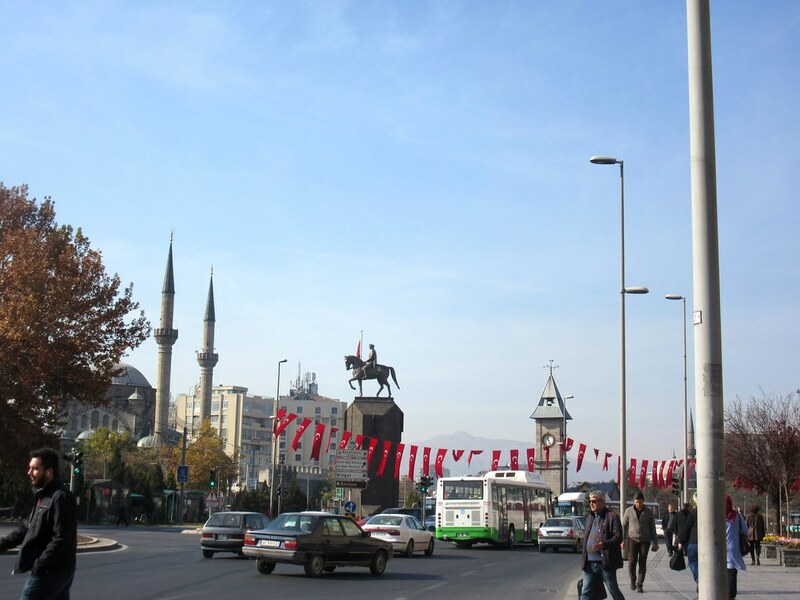 We stop in Kayseri for a coffee and some Turkish pastries, enjoying a leisurely morning. We checked wi-fi for the weather forecast and saw that the predicted snow was now expected a day earlier, ie the next day. 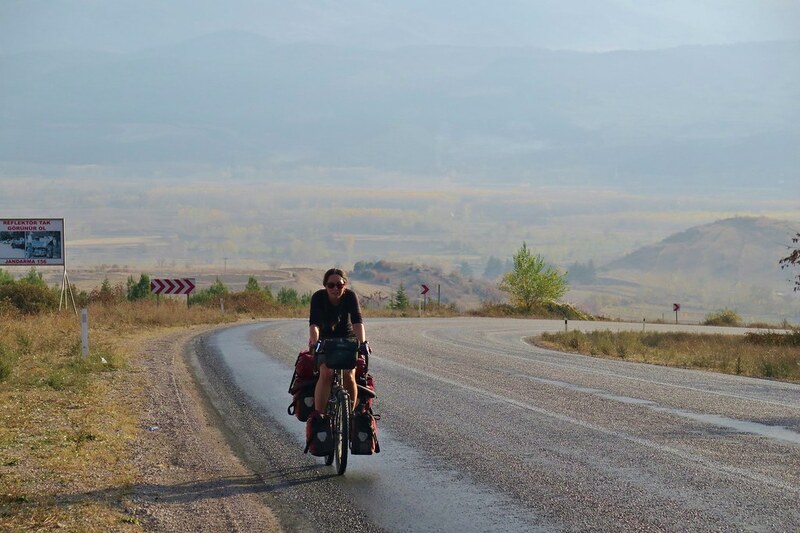 We decided to push on to get us to a guest house in Goreme that day. 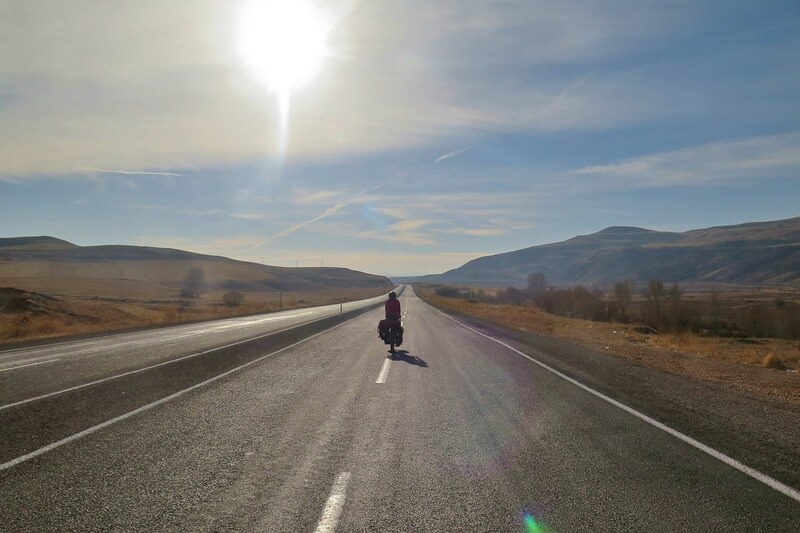 It’d be about 110km but worth it to avoid camping and then riding in cold sleety snow. 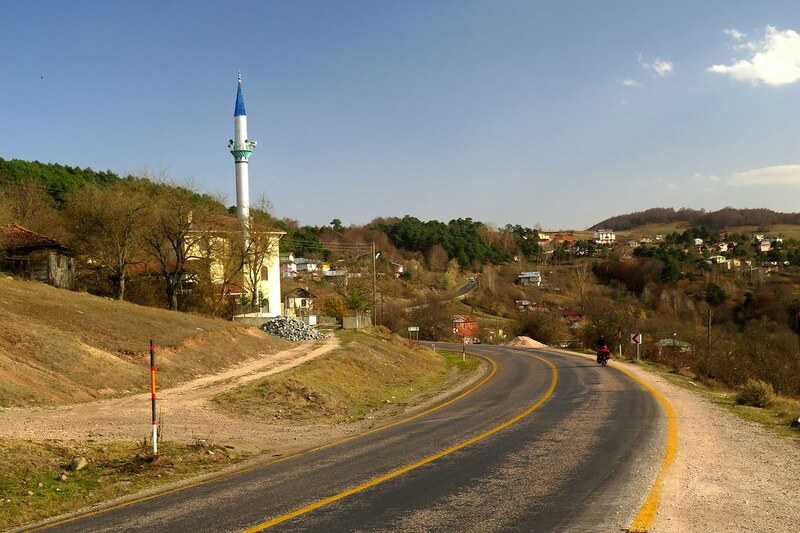 We downed our coffees and headed off, getting out of town as quickly as we could, stopping for a quick kebab on the outskirts. 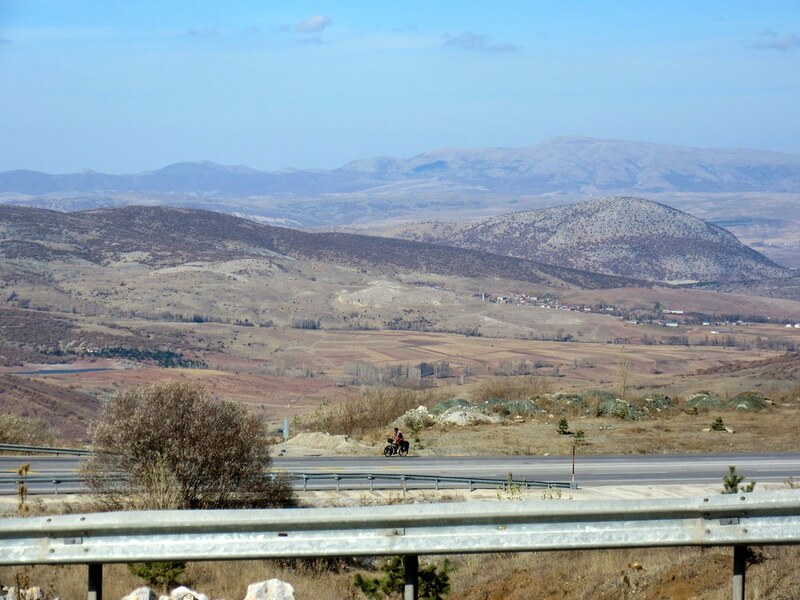 We had a while on a main road and then turned off into some low hills which would take us towards Cappadocia. 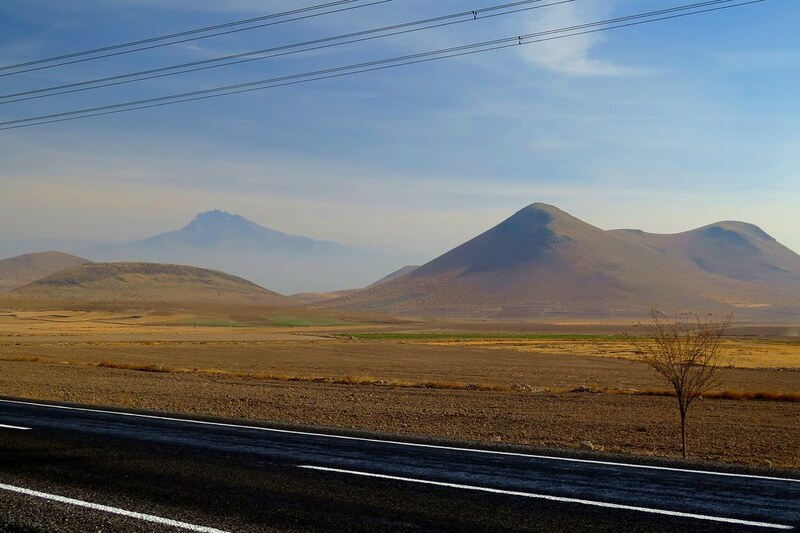 We climbed for a while, the views of Erciyes getting better now that we were away from the smog. Once we got to the top of the climb, we were into a very dry, almost desert like landscape. We were riding fast to get the distance done, but it was one of the most beautiful roads we’ve ridden for a long time. Bare earth and rocky hills all around us, and the odd glimpse of the unique rock pinnacles that Cappadocia is known for. 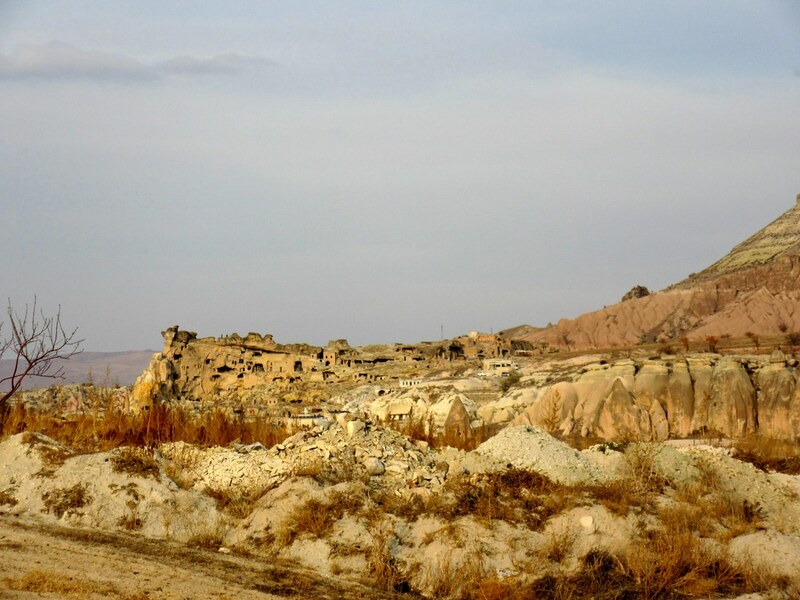 We made good time, slowed only by photo stops, and by about 4 o’clock we were on the last mellow climb into Goreme. The sun was low in the sky by now, casting a golden light over the rocks and caves. It’s clearly low season, the tourist town feels very empty. We find a guest house and get inside for a long overdue shower. The moon has been amazing for the past few days. Of course, it never comes out as good in photos. We had wicked starry nights last week on the coast, you guys would’ve loved it! 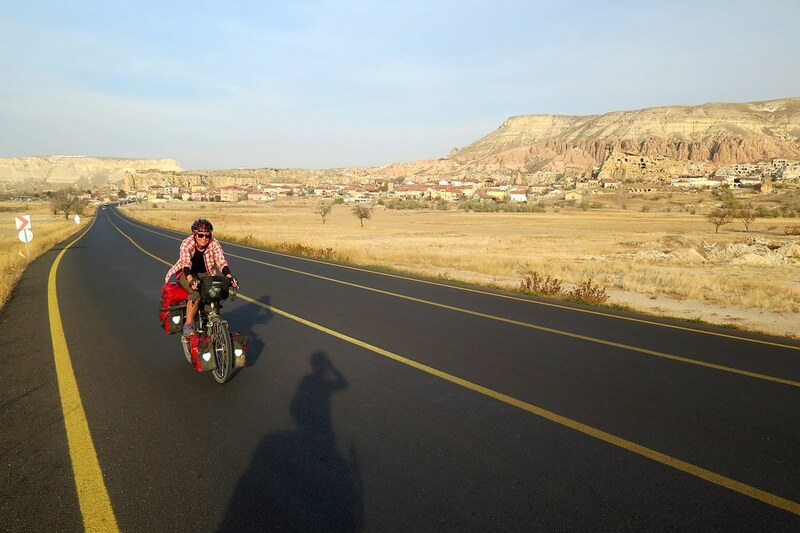 I’m excited that you made the detour down to Cappadocia – it was our standout place in Turkey! 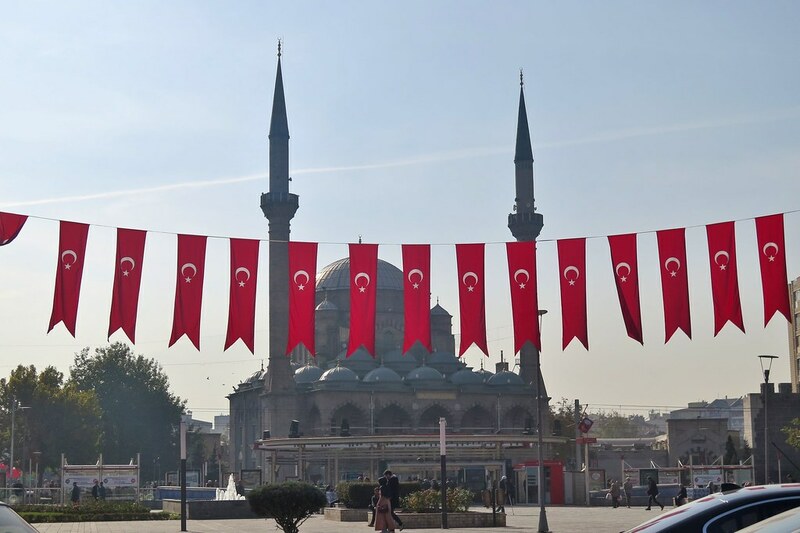 Glad to hear that it’s been smooth (and enjoyable) riding so far in Turkey. Love the colours through the mountains. Great photos. So glad to see you’re getting plenty of blue sky and little rain! Hope it continues. Thanks guys! We didn’t expect to be seeing so much sunshine, it’s been awesome!